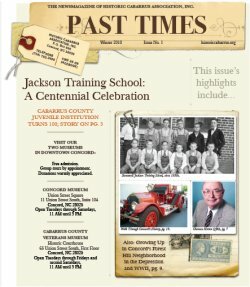 Become A Member | Historic Cabarrus Association, Inc.
Help The Historic Cabarrus Association, Inc continue to provide historical education and resources on Cabarrus County. As a member, you will be entitled to a year-round 25% discount at The Concord Museum Store, a subscription to The Golden Nugget; a quarterly journal on Cabarrus County history and genealogy, and discounts at special events. Plus you will help further our mission to preserve and celebrate our rich heritage! Please provide your full name and mailing address with your donation. Many corporations match your donations; please check with your employer for information and the appropriate form. Please make checks payable to Historic Cabarrus Association, Inc., and mail to: P.O. Box 966, Concord, NC, 28026-0966. You can also help by VOLUNTEERING! Volunteering at one or both of our community museums provides a valuable service to your community, while affording you the opportunity to learn more about our heritage and make new friends and professional contacts. donating your special skills and professional services in applicable ways. For information about volunteering, please visit The Concord Museum during its regular hours of operation, phone us at 704-920-2465, or email us at historiccabarrus@gmail.com. Thank you for helping us look back and move forward!